In a medium saucepan, combine the barley with 3 cups of water and a generous pinch of salt. Bring to a boil. Reduce the heat to moderately low, cover and simmer until the barley is just tender, about 12 minutes. Drain and spread the cooked barley on a rimmed baking sheet. In a large saucepan, cook the bacon over moderately low heat until golden brown, about 12 minutes. Using a slotted spoon, transfer the bacon to a plate lined with paper towels. Pour off all but 2 tablespoons of the fat and reserve for another use. Add the onions and garlic to the saucepan and season with salt and pepper. Cook over moderate heat, stirring occasionally, until the onions have softened, about 8 minutes. Add the celery, carrots and chopped collard greens and cook until softened, about 8 minutes more. Stir in the mustard, crushed red pepper flakes, the tomatoes and their juices, kidney beans and broth and bring to a boil. Reduce the heat to moderately low and simmer the soup until the vegetables are very tender and the liquid has reduced slightly, about 25 minutes. Stir in the cooked barley and parsley. 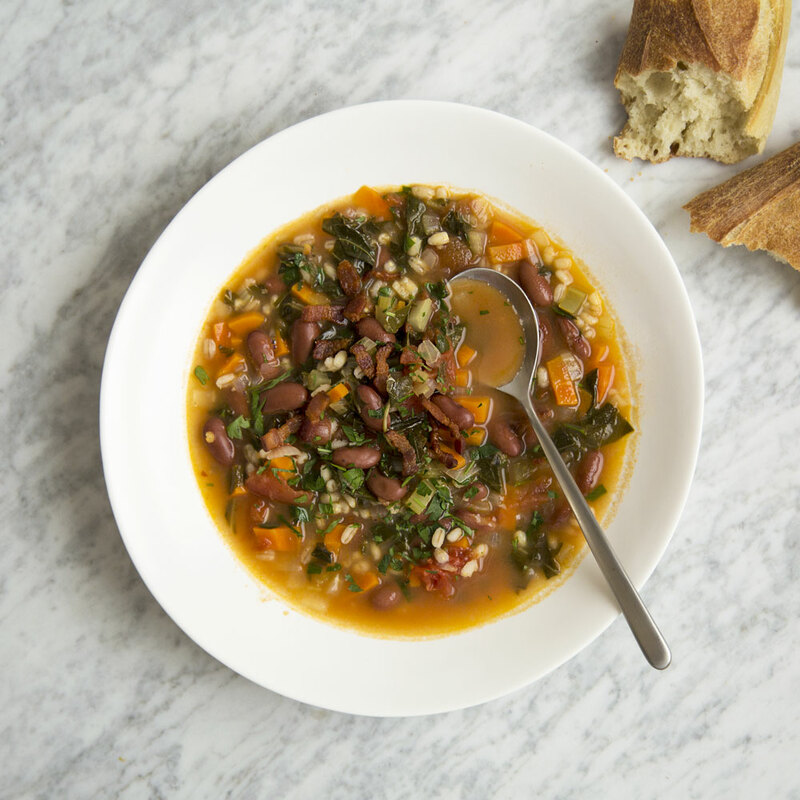 Season the soup with salt and pepper, garnish with the reserved bacon and serve with lots of crusty bread. The kidney bean soup can be refrigerated for up to 4 days. Gently reheat before serving.